Hezemon has formulated strategies that make Email Marketing smoother and Faster. Hezemon makes sure that it gives you maximum design flexibility, pre-set workflows and keep track of your communications strategy at any time! 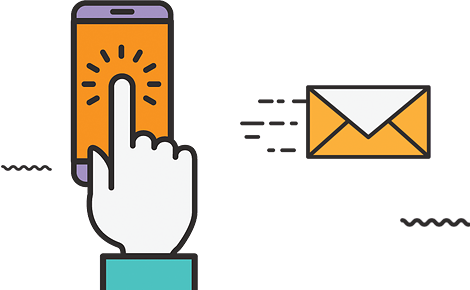 We as team follow a protocol where we • Create single-track and multi-level mailing campaigns • Maintain automated newsletter campaigns that helps you make money while you sleep! Lifecycle mailing concept where the customers receive welcome emails, reminders, re-engagement emails etc. as part of their customer-lifecycle. We are a call away! Let’s brainstorm together for the best marketing strategy for your brand! Services which are incomparable to anyone! No one knows your brand more than you, but here we change the perception as we become one of you when it comes to knowing your brand and its USPs! A perfect marketing strategy takes time and planning and we make sure that we help you determine the message that you send to your target audience. Hezemon helps you have project specific tracking and reporting services which will help you determine if you are on time and within budget. You can track your budget, resources and other issues and stay on track in real time. When it comes to your designing a template for you, we take up the challenge of making it unique and highly valuable and as unique as your brand is too! The Marketing campaigns organized by Hezemon have strategized efforts to promote your company goals. We raise awareness of your new product or service and also capture customer feedback.